Roma set up an Italian Cup semifinal showdown Inter Milan after they beat a poor Juventus side 2-0. 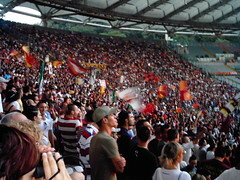 Mirko Vucinic and Rodrigo Taddei were the goal scorers for Roma. In the first half neither side managed to find any rhythm in a match littered with fouls, though Alessandro Del Piero went close for Juventus and Vucinic for Roma. Roma came out strongly in the second half and Simone Perrotta and Fabio Simplicio both squandered chances to open the scoring. Vucinic scored in the 65th minute, cutting in from the left and whipping a curling shot past Juventus goalkeeper Marco Storari into the far corner. Three minutes later, Storari kept Juventus in the game when he stopped Philippe Mexes’ header. With the match almost over, Taddei spectacularly volleyed De Rossi’s free kick home to wrap up the victory.